A home gym is a necessity for our family, because the idea of leaving the house to work out isn’t appealing at all. Raising kids and having a full time job leaves little room for working out….unless you can workout from home. Besides, there is something to be said about working out in your own gym, dressed however you please. If you have been following my blog, you have seen many home renovations we have taken on featuring before and after pictures. This project is similar, with very “unusual” before pictures. Below is a picture of a room in our basement – not really sure what it was being used for before we moved in, maybe a bedroom? Anyway, the room is a great size and has beautiful double doors. When we first saw the space, we immediately knew this room would be our home gym. Those frames on the wall were drywall cut outs used for fish tanks. That’s correct, the prior owner had a couple fish tanks inserted into the walls with a shelf on the other side to hold the tank. Clever? Or another DIY project gone awry. The door pictured below leads into an unfinished closet, that was being used as an office. The drywall job in this room was awful, the ceiling was sagging and the side walls weren’t properly attached to studs. The most important first step in creating our home gym was to secure and reinforce as much drywall as we could to make the room safe. We ended up replacing most panels of drywall since they were in such bad condition. We added a couple more feet to the room by bumping out the back wall where one of the fish tanks had been located. This space will be used to house a pull-up bar. A good home gym must have proper flooring. 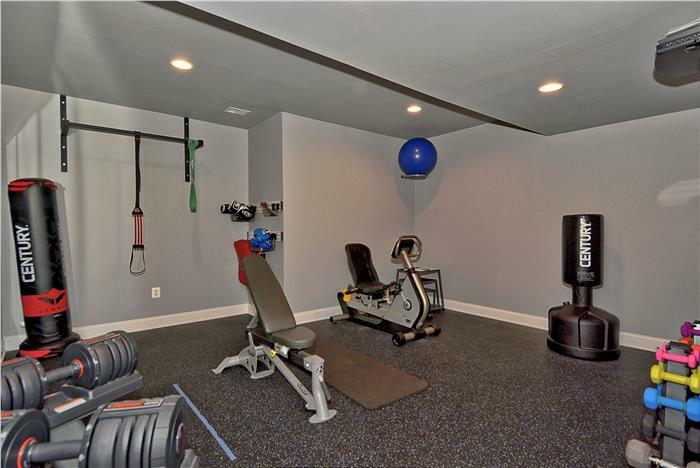 Our home gym flooring of choice is without a doubt rubber flooring. This gym is the second one we have built, and my husband has found that rubber flooring with interlocking tiles are the best solution to add padding and spring, and easiest to install (HERE). We pulled up the old carpet and installed the rubber flooring on top of the cement ground, we do not recommend installing rubber flooring on top of carpet. The purpose of this gym was to be built for high-intensity interval training (HITT), also known as high-intensity intermittent exercise (HIIE) or sprint interval training (SIT). This type of interval training combines cardiovascular exercise and alternating short periods of intense anaerobic exercise. My husband wanted as little equipment as possible in the room to utilize space to train with “P90X” and “Insanity” workout DVD’s. In order to train with the videos in our gym, we needed a TV and a DVD player. We found the perfect solution with this TV Mount (HERE), and wall rack to hold the DVD player and cable box (HERE). My favorite part of this configuration is not having any wires or cables showing, they are all hidden. In order to do resistance training, we needed a pull-up bar that could support our weight and it needed to be mounted into studs. My husband found the perfect sturdy bar to suit our needs (HERE). We also needed resistance straps for the P90X training (HERE). We were very pleased with these finds. Every gym needs a set of great weights, and since we were trying to conserve space in our gym, we purchased a set of Bowflex adjustable weights (HERE). My husband loves them! Each dumbbell adjusts from 5 to 52.5 pounds in increments of 2.5 pounds. This set is perfect for small spaces since you eliminate the need for multiple dumbbell sets. The stand for the dumbbells is really sturdy and sharp looking and an added benefit is that you don’t have to bend down to pick up the weights (HERE). My girly weights aren’t as heavy, but they are perfect and comfortable to use (HERE). Another important aspect of strength training we use, is a fight simulator bag for kicking (HERE) and the aerobic wave master (HERE). Yoga mats are also useful for pre and post workout stretching. The space turned out perfectly and allows us ample room for floor exercises and P90X training. Lastly, we painted the room using Sherwin Williams color Mindful Gray. Thanks for stopping by, hope you found this post useful when you build a home gym.